Have you ever walked into your Sunday church service feeling sad or suffering in some way? Maybe there are times when you’ve been sick, just feeling off , or mourning some loss that made it hard to be your typical self in Sunday worship. Or, perhaps you have a condition or mental illness that flares up sometimes and leaves you unable to partake in the usual joys of Sunday fellowship? When this happens in church, do you feel you are able to be your wounded self? Is there a space in the service or the social conversations to meet with God in your afflicted state? Better yet, is there a physical place within the meeting space where you can feel welcomed and relaxed despite your difficulties? Hopefully some of us can say yes, our church family and meeting space have room for the bad days as well as the good. Unfortunately, it seems the average church does not. Whether one’s mental condition is temporary or constant, our churches do not seem well equipped to accommodate the variety of mental health needs most congregations encounter. Why is this the case? The Church is supposed to be a place of welcoming, fellowshipping, and renewing for all, isn’t it? I believe this deficiency may be partly due to the lack of emphasis placed on mental health training in our seminaries. If pastoral students aren’t expected to be trained in mental health issues, then how can we expect leading pastors to serve the mental health of our churches? To be fair, the variety of expectations laid upon the pastorate position in our churches already makes being a pastor quite difficult at times. Many pastors are expected to spend hours every week studying and preparing sermons, organizing studies, outreaches and small groups, counseling marriages and individuals, and often attending hours of ministry meetings each week. It is a challenging calling, and seminaries generally do an excellent job trying to prepare future pastors for this cacophony of shepherding tasks. Mental health and counseling, though, remain an exception. The average pastoral seminary student graduates with little mental health and counseling training. 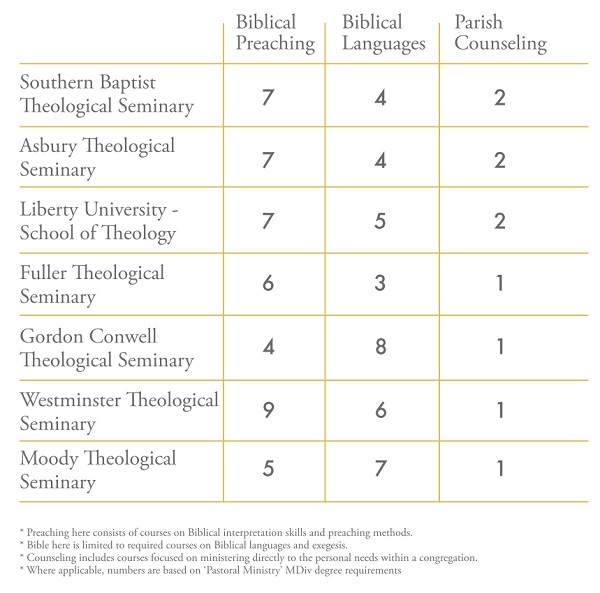 Based on a quick survey of top US seminaries, most Master of Divinity pastoral training programs require one or zero courses in counseling, compared to four to eight courses in Biblical languages and six to twelve courses in Biblical preaching. This should be alarming given that every year roughly one in five American adults experiences some form of mental illness . This means the average pastor, at best, has only introductory knowledge of what to look for and how to treat mental health in the congregation. As a result, those who are already suffering through their mental illness are too often left to suffer more by their church’s lack of sensitivity and support. While many trained pastors have the option to take elective counseling courses or separate counseling certifications throughout the years, the majority of pastors are simply not equipped to handle the variety of issues many Christian families face in life. Perhaps even worse, due to this lack of knowledge they are not in a position to empathize with and create constructive spaces in their congregations for those with mental health issues. To better serve our congregations and communities, perhaps it is time to change this. If your current pastor hasn’t had much counseling training, petition your church to create space and funding for additional training or a certification. Matt Reffie studies Church History and sells antique documents and ephemera for a living. He grew up in rural Pennsylvania and has worked with Lutheran, Baptist, Presbyterian, and Mennonite congregations as an associate pastor, deacon, and campus minister over the years. He currently lives in Somerville, MA with his wife, Audrey, and thoroughly enjoys being ‘tickle monster’ to their ten nieces and nephews.